Download QuickStego Now - It's Free! * Operating System - Windows XP or Vista or 7. What does QuickStego let me do? What does QuickStego NOT do? 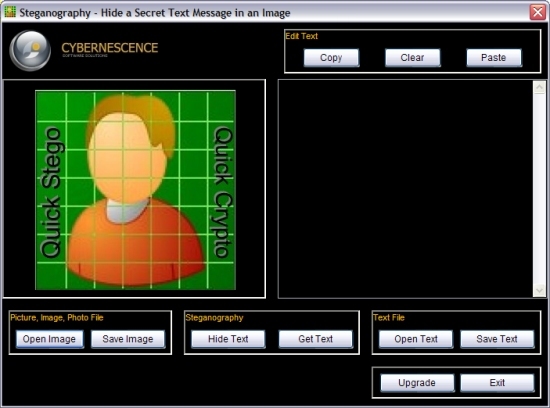 QuickStego does not ENCRYPT the secret text message though it is well hidden in the image. If you require the message to also be encrypted (so even if found it can't be read without knowing a password) then QuickCrypto is the product for you. QuickCrypto includes the functions of QuickStego but also allows you to securely encrypt text and files and even hide files on your computer. QuickStego will not let you hide files in images, to do that you require QuickCrypto. QuickCrypto can hide secret text and/or files in picture images. Quite honestly, QuickStego is provided free of charge as we hope you will like the software and wish at some point to upgrade to QuickCrypto or other Cybernescence products. Given QuickStego is freeware, is it supported? Yes, the core functions of QuickStego are also part of QuickCrypto, therefore the product will be supported for the foreseeable future. Functionality on its way, is the ability to hide messages inside audio files, e.g. mp3 and wav. How much text can be hidden in each picture? QuickStego imperceptibly alters the pixels (individual picture elements) of the image, encoding the secret text by adding small variations in color to the image. In practice, to the human eye, these small differences do not appear to change the image. QuickStego was featured in PC Plus magazine as part of a series of articles (in editions 296 and 297) on Cryptography and Code-Breaking. The article in edition 297 highlights that software like QuickStego can complement Cryptography by hiding encrypted items in images to make them appear unworthy of interest from a cryptanalysis point of view. BY ACCEPTING, YOU (THE USER OF THIS SOFTWARE) INDICATE YOUR ACCEPTANCE OF THESE TERMS. IF YOU DO NOT WISH TO ACCEPT THE PRODUCT UNDER THESE TERMS YOU MAY CHOOSE NOT TO ACCEPT BY NOT DOWNLOADING OR NOT INSTALLING THE SOFTWARE. Every effort has been made to make this software as complete and as error free as possible, but no warranty of fitness is implied. THE ENTIRE RISK AS TO THE QUALITY AND PERFORMANCE OF THE SOFTWARE IS WITH YOU THE USER. CYBERNESCENCE SOFTWARE DOES NOT WARRANT THAT THE SOFTWARE OR ITS FUNCTIONS WILL MEET YOUR REQUIREMENTS OR THAT THE OPERATION OF THE SOFTWARE WILL BE UNINTERRUPTED OR ERROR FREE OR THAT ANY DEFECTS WILL BE CORRECTED. NO LIABILITY FOR CONSEQUENTIAL DAMAGES - IN NO EVENT SHALL CYBERNESCENCE SOFTWARE OR ITS VENDORS BE LIABLE FOR ANY DAMAGES WHATSOEVER (INCLUDING, WITHOUT LIMITATION, DAMAGES FOR THE LOSS OF BUSINESS PROFITS, BUSINESS INTERRUPTION, LOSS OF BUSINESS INFORMATION, OR ANY OTHER PECUNIARY LOSS) ARISING OUT OF THE USE OR INABILITY TO USE THE SOFTWARE, EVEN IF CYBERNESCENCE SOFTWARE HAS BEEN ADVISED OF THE POSSIBILITY OF SUCH DAMAGES. THIS PRODUCT IS PROVIDED "AS IS" WITHOUT WARRANTY OF ANY KIND, WHETHER EXPRESS, IMPLIED, OR STATUTORY, INCLUDING, BUT NOT LIMITED TO, THE WARRANTIES OF MERCHANTABILITY, FITNESS FOR A PARTICULAR PURPOSE, AND NON-INFRINGEMENT. THE ENTIRE RISK AS TO THE QUALITY AND PERFORMANCE OF THIS PRODUCT IS WITH YOU. SHOULD THIS PRODUCT PROVE DEFECTIVE, YOU ASSUME THE COST OF ALL NECESSARY SERVICING, REPAIR, OR CORRECTION. THIS PRODUCT MAY INCORPORATE IMPLEMENTATIONS OF CRYPTOGRAPHIC ALGORITHMS THAT ARE REGULATED (E.G., SUBJECT TO EXPORT/IMPORT CONTROL REGULATIONS) OR ILLEGAL IN SOME COUNTRIES. IT IS SOLELY YOUR RESPONSIBILITY TO VERIFY THAT IT IS LEGAL TO IMPORT AND/OR USE THIS PRODUCT (OR PORTIONS THEREOF) IN COUNTRIES WHERE YOU INTEND TO USE IT, AND IT IS SOLELY YOUR RESPONSIBILITY TO COMPLY WITH ANY APPLICABLE REGULATIONS, RESTRICTIONS, AND LAW. IF YOU ARE NOT SURE WHETHER YOU UNDERSTAND ALL PARTS OF THIS LICENSE OR IF YOU ARE NOT SURE WHETHER YOU CAN COMPLY WITH ALL TERMS AND CONDITIONS OF THIS LICENSE, YOU MUST NOT USE, COPY, MODIFY, NOR (RE)DISTRIBUTE THIS PRODUCT, NOR ANY PORTION(S) OF IT. YOU SHOULD CONSULT WITH A LAWYER.